I hope everybody had a great Thanksgiving. We did, but getting there and back wasn't so fun - at least for me the driver anyway! Dawn & the kids (our 2 sons and our niece) watched movies, played x-box, ate and napped while I slowly trudged along in the holiday traffic. AAA said that over 40 million travelers would be on the roads and highways over the holiday; I think 35 million of them were heading north on I-95 last Wednesday. It took about 3 hours longer than usual to make our trek north, but once there it is always nice to have the RV with us. With a house full of relatives and friends it's great to have our own home on wheels and our own bed to sleep in. It works out well with our 2 dogs too, something I'm sure my mom appreciates with her 2 dogs under foot in the house already. With no RV trips planned in the immediate future we will prep the motorhome for a couple of months of storage and look forward to planning next year's camping trips. One trip I am already aware of is to my nephews wedding, which will take us from North Carolina to Washington state. We plan to take our time and enjoy many of the sites along the way. But first we will enjoy the Christmas holiday season and see what's in store for us with the new year. Speaking of Christmas, from now until December 20th all of our single DVD's are on sale for $19.95. They make great stocking stuffers for the RVer on your Christmas list, and our already deeply discounted DVD box sets make great gift ideas too. 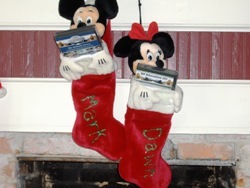 GREAT RV CHRISTMAS GIFTS or Stocking Stuffers!!!! NOTE: Make sure you order by 15 December if you want it in time for Christmas!!!! These DVD sets make a great stocking stuffer for your favorite RVer.....So hurry now for some great RV Education at a great price! Gross Combined Weight Rating (GCWR) is the maximum permissible weight of the tow vehicle and trailer combined when both are fully loaded for travel. GCWR also applies to a motor home towing a vehicle or trailer behind it. GCWR minus GVWR represents the allowable weight for the towed vehicle. Note: The hitch receiver mounted on the towing vehicle must be rated for this amount of weight. If it is rated for less, then that is the maximum amount you can tow. Valve Extenders: If you have dual wheels you will want to add extension hoses to the valve stems to make the job of checking tire pressure easier. A word of caution, if you add extension hoses you will want to replace the rubber valve stems with all steel valve stems. The added weight of the extension hoses can cause rubber stems to leak air resulting in under inflation. Q. You may already be aware of this but I was a little surprised when I read it. Go to: discounttire.com According to this the speed rating for all "ST" tires is 65 mph. I'm wondering if this is accurate? If it is I'm guilty of running my trailer tires at and sometimes over their speed rating on a regular basis. Actually trailer tires are not tested for high speed ratings like passenger car tires, but ST tires are all lumped together and said to be rated at 65 mph. The concern with this is that once you exceed the 65 mph the excess heat generated will decrease the load rating of the tire as well. If the trailer is already at, or close to, the GVWR and you exceed 65 mph the tires can't handle the same load amount. On the other hand if the trailer is significantly under the GVWR it isn't as serious of a problem. You can also increase the air pressure to offset the speed as long as you don't exceed the max pressure indicated on the tires sidewall. Other people choose to change out tires with LT tires with the same load ratings as the ST tires. These tires do have speed ratings. But in reality 65 mph is probably a fast enough speed to travel at, even though I too have been guilty of exceeding 65 mph once in a while.